Brent B. “Chris” Green | Duncan Green, P.C. Chris was born in Spencer, Iowa. He spent his childhood on his mother’s fishing resort on West Lake Okoboji. Chris attended the University of Iowa where he received his B.A. in 1963 and his J.D., with distinction, in 1965. Chris began practicing law in New York. In between practicing law in New York and eventually in Des Moines, he served in the U.S. Army, including a one-year tour in Vietnam in the Staff Judge Advocate Office of the Saigon Support Command. He was awarded a Bronze Star Medal for meritorious service in a hostile zone. He was honorably discharged as a Captain. 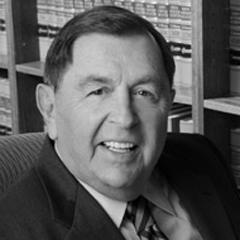 After returning to the practice of law in Des Moines, he co-founded Duncan Green, P.C., in 1993. His profession as a trial lawyer was an integral part of his life. His practice included business litigation, professional liability defense, and commercial litigation just to name a few. He was a Master at the American Inns of Court and a Fellow at the Iowa Academy of Trial Lawyers, International Society of Barristers, American College of Trial Lawyers, and American Academy of Appellate Lawyers. He was consistently selected as a Great Plans Super Lawyer and was named in Best Lawyers in America from 2002-2012. Chris also co-authored "Iowa Tort Law", which was published in "Tort Handbook: A Fifty State Compendium." Chris enjoyed spending time with his family, especially on Lake Okoboji. He had a lifelong passion for fishing. Some of his other hobbies included hunting, golfing, traveling, reading, and rooting for the Iowa Hawkeyes.